Boohind Lock and Key (or World 5-3) is the third level of World 5 and the nineteenth level overall in Super Mario Run. Its name is a pun on the phrase "behind lock and key". The level begins in a wraparound area with a Key Door, along with Boos and a key above. The player must jump up and grab the key, luring one of the Boos over and causing it to disappear and drop the first Pink Coin nearby, then enter the door. The next segment consists of many trampolines and Stretches. The player must bounce on the first available trampoline, jump from a Pause Block, immediately bounce from the next trampoline, then avoid the next trampoline to get the second Pink Coin. The player must then immediately jump on the next trampoline to get the third Pink Coin, then hit a Brick Block to get the next key and open the Key Door up ahead. The third room consists of more Boos. The player must travel up to the top platform and jump to get the fourth Pink Coin, then lure over two Boos, one with the key and the other holding the fifth and final Pink Coin, over to the back arrow blocks and jump on them to collect both items and enter the door. A few more trampolines appear, as well as the Goal Pole. 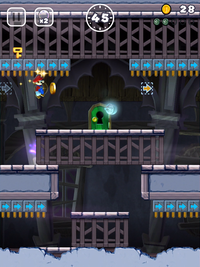 The level begins in a wraparound area with a Key Door, along with Boos and a key above. The player must jump up and grab the key, immediately jump and hit the center Brick Block to get the first Purple Coin, then enter the door. The next segment consists of many trampolines and Stretches. The player must avoid the first available trampoline to get the second Purple Coin, then after looping back around, bounce on the first available trampoline, jump from a Pause Block, immediately bounce from the next trampoline, then avoid the next two trampolines to get the third Purple Coin. After looping back around, the player must bounce on the top left trampoline and hit a Brick Block to get the next key and enter the door just up ahead. The third room consists of more Boos. The player must jump up to the platform above, then carefully jump across to get the fourth Purple Coin. They must then travel up to the top platform and lure over two Boos, one with the key and the other holding the fifth and final Purple Coin, over to the back arrow blocks and jump on them to collect both items and enter the door. A few more trampolines appear, as well as the Goal Pole. The level begins in a wraparound area with a Key Door, along with Boos and a key above. The player must jump up and grab the key, luring one of the Boos over and causing it to disappear and drop the first Black Coin nearby, then enter the door. The next segment consists of several sticky walls. The player must climb on the first one, then drop down onto a platform and jump carefully to get the second Black Coin. The player must then travel to the door and lure a Boo to make it disappear and drop the third Black Coin nearby. They must then jump over the sticky wall and grab the key to enter the door. The third room consists of many yellow arrow blocks. The player must hit three Brick Blocks just above the door to turn them into yellow arrow blocks, then, after looping back around and collecting the fourth Black Coin use these arrow blocks to reach the top and grab the fifth and final Black Coin as well as the key to open the door. A few trampolines appear, as well as the Goal Pole. Ghost-Door Deception • Sky-High Lifts and Leaps! • Treasure-Hoarding Swoops • Airship Cannons...Fire! Big Spiny Blitz • Bullet Bill Barrage • Shell Me the Way! • Fire Bar Castle! Youch! Lakitu's Revenge • Pokey Vaulting • Boohind Lock and Key • Rings of Fire! This page was last edited on March 8, 2019, at 06:13.